Why talk about the heart from a medical point of view? How boring, unless you're a doctor that is. Right? By looking at the basic anatomy and physiology of the heart from a doctor's perspective, we gain a unique privilege. We get to evaluate that perspective. Once we understand the underlying basis of medical treatments used to correct heart problems, we can make informed decisions as to which of those treatments and medications actually make sense for us...and, more importantly, what alternatives might actually work better. So with that in mind, let's take a look at the human heart. Your heart is located between your lungs in the middle of your chest, immediately behind and slightly to the left of your breastbone (sternum). In this location, it is protected by the breastbone in front, the spinal column in back, and the ribs on the sides. It weighs 7-15 ounces and is about the size of a human fist. With each beat, the heart muscle expands and contracts, sending 2 to 3 ounces of blood on its way through the vascular system. The full circuit around the lungs and body (covering a mind boggling 50-60 thousand miles of branching blood vessels) takes only about one minute to complete when the body is at rest. In that same minute, your heart can pump some 1.3 gallons of blood to every cell in your body. Over the course of a day, we're talking about 100,000 heartbeats shuttling some 2,000 gallons of oxygen rich blood throughout your body. That works out to some 35 million beats a year and an unbelievable 2.5 - 3.5 billion beats in a lifetime. Another way of looking at it is that the heart pumps approximately 700,000 gallons a year and almost 50 million gallons in an average lifetime. I will cover the circulatory system in detail in its own newsletter at a later date, but for now it's important to understand in our discussion of the heart that the heart actually pumps blood through two very distinct circulatory systems. The systemic system is what most people think of when they think of the circulatory system. That's the system that feeds the organs, tissues, and cells of your body. That's the system in which fresh oxygenated blood pumps out through the arteries and in which deoxygenated blood returns to the heart through the veins. The pulmonary system is actually quite different – just the opposite in fact. Deoxygenated blood is pumped out of the heart through the pulmonary arteries into the lungs, and recharged oxygenated blood returns to the heart through the veins. It is this recharged oxygenated blood that gets pumped out through the systemic circulatory system. Understanding these differences will be important later. For now, just consider the simple fact that these two separate systems must be perfectly balanced in terms of input and output. If for example, the pulmonary system is just one drop a minute behind the systemic system, in short order, the left ventricle of the heart (the chamber that pumps blood out to your body) will become under-filled with blood and cease to function efficiently. The tissue of the heart is comprised of three layers. The primary layer, the middle layer, is called the myocardium. This is the actual muscle tissue of the heart and the part of the heart that will feature most prominently when we talk later about what can go wrong with the heart. The myocardium is a thick strong muscle and comprises the bulk of the heart. It is formed of smooth involuntary muscle like your intestines and your bladder – but with a several key differences. It has built in rhythmicity. That is to say, unlike other muscle tissue, it is self-stimulating and doesn't require a signal from the nervous system to contract. The myocardium is lined on the inside (where all the blood is pumping) with a thin membrane called the endocardium. On the outside, the myocardium is enclosed by a membranous sac filled with fluid called the pericardium. The outside of the pericardium sac is pressed against the lungs and the chest wall. The inside of the sac (called the visceral pericardium) is actually attached to the heart muscle. The purpose of the sac is to hold the heart in place, protect it, and eliminate inflammation by protecting the heart from friction as it beats. If you think about it, every time the heart beats it expands and contracts rubbing and sliding against the lungs and the chest wall. It is the fluid filling the pericardial sac that allows the inner and outer parts of the sac to slide against each other with no friction thus allowing the heart to beat some 2.5 - 3.5 billion times in a lifetime without rubbing itself raw. The heart itself is divided into four chambers: the right and left atria and the right and left ventricles. As you can see below, it is separated vertically by part of the myocardium heart muscle. Horizontally, the two halves are further divided by two valves – the mitral or bicuspid valve on the left side of the heart (right side of the illustration) and the tricuspid valve on the right. ©1996-2007 MedicineNet, Inc. All rights reserved. The flow of blood through those chambers is actually quite simple. All of the deoxygenated blood in need of “recharging” returns to the heart through the large veins called the vena cava ( anterior and posterior). The two vena cavae empty into the right atrium, the first chamber in the heart. (Incidentally, one of the definitions of atrium is a forecourt of a building – which is essentially what the atria are: forecourts to the two ventricles.) From there, the blood passes through the one-way tricuspid valve into the right ventricle, which pumps it out through the pulmonary valve into the pulmonary aorta and into the lungs. Note in the illustration above how much smaller the left ventricle is than the right and how much thicker the muscles are surrounding it (about 4 times thicker). The reason is simple. Smaller chamber and greater force of contraction means greater pressure. When you consider that the right ventricle only needs to push the blood a few inches into the lungs and back, whereas the left ventricle needs to push the blood throughout the entire body, this makes sense. In fact, the left ventricle produces about 4 times the pressure of the right ventricle. It is through this difference in pressure that the body keeps the blood supply perfectly balanced between the two chambers even though they are powering two entirely different circulatory systems. Once oxygenated, the blood makes the short trip back through the pulmonary veins and back into the heart, entering through the left atrium. This is the pulmonary circulatory system we referred to above. © 1996-2007 WGBH Educational Foundation. From the left atrium, the oxygenated blood passes down through the one-way mitral valve and into the left ventricle. From there, the large muscles surrounding the left ventricle squeeze the blood out through the aorta as it starts its circuit out to every single cell in the body. At this point, a quick discussion of the two main valves in the heart (the mitral or bicuspid valve, and the tricuspid valve) makes sense. In construction and function, the two valves are quite simple, but extremely important. Fundamentally they look like parachutes with tendons or cords running down into the ventricles to keep them from opening too far. (See below.) When there is no blood in the ventricle below them, there is no pressure on the valves, and they are in the open position. In the open position, blood can passively move from the atrium above down through the openings in the valve into the ventricle below. Once the ventricle fills with blood and the heart contracts creating pressure in the ventricle, that pressure pushes up on the bottom of the valve forcing it closed so the blood cannot flow back into the atrium above. At that point, the blood has only one way out of each ventricle – through the main pulmonary artery in the right ventricle and the aorta in the left ventricle. The system is brilliant, totally passive, and amazingly durable. For most people it functions flawlessly for 70-100 years, through 2.5 billion plus heartbeats. For a great review of everything we've talked about so far, check out the medical animation from the University of Pennsylvania Health System. Once the oxygenated blood leaves the heart and heads into the aorta, it almost immediately encounters the first two blood vessels off the aorta: the left and right coronary arteries. 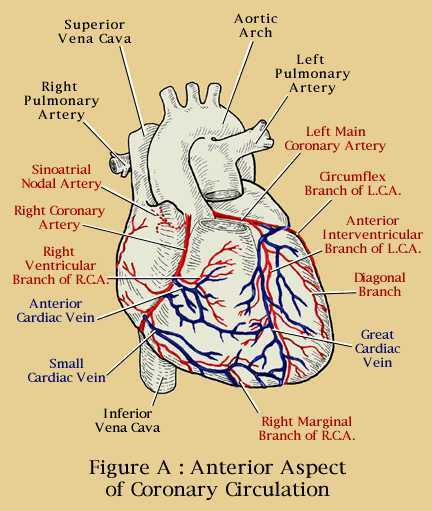 These are the main arteries that feed the heart muscle, the myocardium. One of the first things you'll notice in the illustration below is how much branching and redundancy there is in the arteries and veins that feed the heart. Copyright 2007 Forum Multimedia Publishing, LLC. All rights reserved. The medical term used to describe this branching is anastomosis. You don't have to remember it. Just remember that the blood vessels of the heart have many branches that reconnect in multiple places to provide alternate pathways for the blood in case one branch is blocked. In fact, there is so much redundancy, that your heart can function with no visible symptoms with up to 70% blockage. It's almost as though nature anticipated the western fast food diet and built in a huge reserve capacity knowing how aggressively we would seek to clog the system up. What makes the heart muscle contract? For now, just understand that when a muscle cell is excited, an electrical signal is produced and spreads to the rest of the muscle cell, causing an increase in the level of calcium ions inside the cell. The calcium ions bind and interact with molecules associated with the cell's contractile machinery, the end result being a mechanical contraction. To simplify this, a sodium ion starts the stimulation of the cell, a calcium ion extends that stimulation to allow the entire muscle to contract before potassium comes along and tells the muscle cell to relax for a moment and get ready for the next wave. Even though the heart is a specialized muscle, this fundamental principle still applies. (Makes you think about the importance of minerals in the diet, doesn't it?) One thing, however, that distinguishes the heart from other muscles is that the heart muscle, as we've already discussed, has built in rhythmicity. Thus, an electrical excitation that occurs in one cell easily spreads to neighboring cells. Under normal circumstances, the initial electrical excitation that starts the beat of the entire heart originates in the pacemaker cells of the sinoatrial node, located on top of the right atrium. This small group of cells pretty much serves as the impulse-generating pacemaker for the heart and normally discharges about one hundred times per minute. These impulses move down through fibers in the myocardial wall and come together in the atrial ventricular node where they are slowed down before entering and stimulating the controlled contraction of the muscles surrounding the two ventricles. A simplified picture of the electrical system of the human heart. PF (= Purkinje fibers), VM (= ventricular myocardium). As mentioned in the paragraph above, there is a moment of rest in the contraction of the muscle cells as the heart prepares for its next beat. This moment of rest is actually critical as we will discuss in the next newsletter as a spurious impulse during this rest period can cause premature contractions leading to compromised filling and poor ejection of blood from the heart. This can lead to life threatening arrhythmias that so severally compromise the heart's ability to pump that death can occur quickly. As an interesting side note, when doctors or EMTs use a defibrillator to get a "fluttering" heart going again, the primary effect is to depolarize the heart muscle and actually stop the heart. The electric shock from the defibrillator doesn't switch the heart back on. Instead, defibrillation actually stops the heart briefly! It's this stoppage of the heart that allows the sinoatrial node to reestablish control of the heartbeat. What can go wrong with it. What things must be handled by a medical doctor. Thank you. As a student at BCIT's Cardiology Technology program, I can really appreciate diagrams that clearly illustrate the coronary tree. Thanks for the much needed clarification. Can exercise reverse left ventracular hyperthropy? Left ventricular hypertrophy (LVH) is considered to be a normal adaptive mechanism caused by an increased workload of the heart, of which the most common cause is hypertension. However, there are many other causes of LVH including aortic stenosis, coarctation of aorta, thyrotoxicosis, obstructive sleep apnea, and diabetes mellitus. In the short term, an increase in left ventricular mass may be of some benefit as it permits the myocardium to compensate for any increase in wall stress. The adaptation can also help overcome any acute hemodynamic compromise. However, in the long run, LVH is harmful. Chronic LVH has been recognized as a risk factor for cardiovascular events, stoke, and premature death.